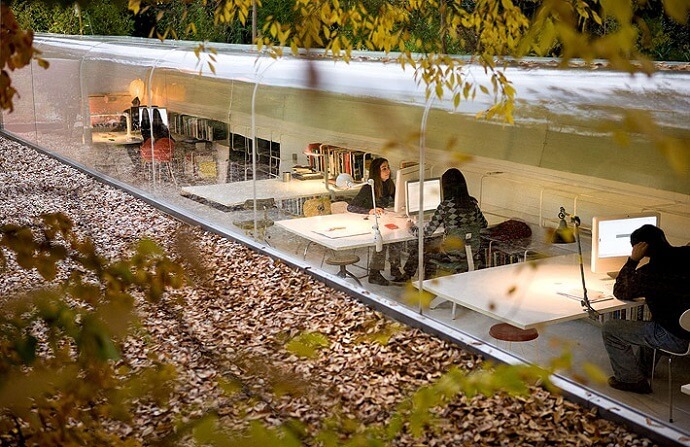 What would you say if you had your office located in the woods? We bet it would be an interesting experience and the idea of working in the middle of the nature is certainly an unconventional office design approach. Spanish architecture firm Selgas Cano is responsible for this creative office space, which is in fact their own architecture office situated amongst downtown Madrid’s trees. Its exterior appears as a long and narrow tube like structure with half of it opaque to ensure privacy and with a huge window on the other half, that makes you feel a part of the nature, while flood the office space with natural light from the surrounding landscape. Looking at these pictures, the view is fantastic whether you’re inside or outside. The building which is almost underground built features an extremely minimalist design inside. Vibrant lime, yellow and orange touches contrast with the dominant interior color, white, giving a fresh and appealing look. Enjoy the photos!